Description : The ‘Chalet de Patou’, both comfortable and modern, is located nearby a private pond surrounded by woods. It is perfect to go fishing or just to relax in a beautiful and quiet area. Location : located in a quiet area in the nature, but close to shops, you are 5 km from the village of Pompadour, 7km from Ségur le château, classified one of the ‘plus beaux villages de France’ (most beautiful villages of France). Corrèze is an area known for its heritage, gastronomy and nature. The pond: it is possible to fish, to relax with a paddle boat (2 are available). There are also some ‘discovery’ treks around the pond. 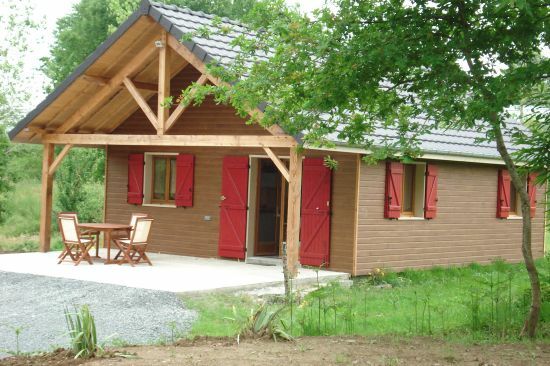 The chalet : the chalet is brand new, comfortable, it’s a place where you will feel at home! It is in a quiet area, 100m from the pond but 200m from the road ‘rue du lotissement du bois de Chouet’. It is on the ground floor, independent, with a terrace facing North-west and the pond. The chalet’s equipment : fully-equipped kitchen, electric oven, hot plate (bottled gas & electric), hood, fridge with freezer, microwave, coffee machine, dish-washer, washing machine, TV and electric heating system. Outside : garden furniture, barbecue, clotheshorse, and outdoor games (swing, toboggan).